At the request of Margit “Buba” Antauer, the longtime festival director of Animafest, the second oldest animation festival in Europe, held annually in Zagreb, Croatia, Adam Snyder and Jerry Beck assembled a pristine collection of UPA theatricals, through Michael Schlesinger, at Sony Pictures, plus we added the first edited sequence from the UPA documentary, then just in it’s very early stages. Because of that, and the the fact that neither Snyder or Beck could attend, and finally through the urging of Giannalberto Bendazzi, who we’d met in Santa Monica, California, several years earlier, when Bendazzi interviewed Bosustow about Bobe Cannon, Buba had not other choice but invite Tee Bosustow and his daughter to attend the Zagreb festival. After the screening, Bosustow was invited up on stage for a spontaneous Q&A with the audience. In those short couple of years since Tee had begun work on the documentary, he’d gone from very limited knowledge of animation, and even UPA, to somewhat of an expert. In fact, that first impromptu appearance at Zagreb was so well received that suddenly Tee became the go-to person for UPA presentations. From then on, Tee was invited to a half dozen or so international animation festivals in Europe, Canada, South America, and Australia. 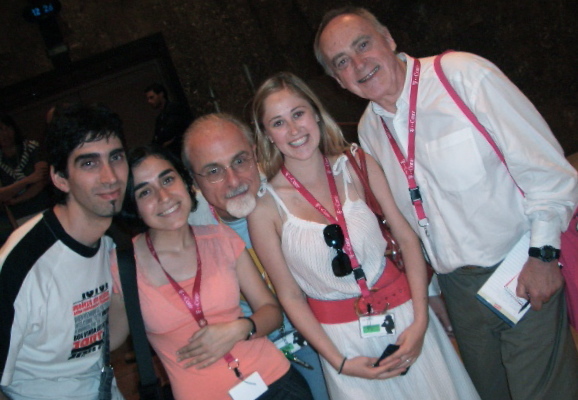 Pictured above are two Argentine animators the Sylvie befriended, Juan Pablo Zaramella and Silvina Cornillón, then in the middle, animation historian, Giannalberto Bendazzi, and finally, Sylvie Bosustow, and her father, and now, presenter, Tee Bosustow. Silvina Cornillón, incidentally, became a crew member on the documentary, and helped organized the UPA presentations at the BAFICI festival in Buenos Aires, nearly a decade later.